Customers often ask us if IKEA’s kitchen cabinets are as inexpensive as everyone says. 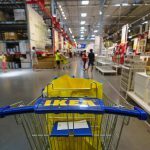 They know that IKEA’s a great brand and their cabinets are well-built — but how do they compare in price to Home Depot or Lowes? Or other brands? It’s hard to know especially since IKEA just offers the cabinet price — no assembly or installation. While the other brands include both. There’s very little info or references about IKEA’s complete kitchen cabinet pricing. So we decided to help by showing a series of IKEA kitchens that we’ve designed with the actual cabinet costs. Of course all IKEA kitchens are different — but you’ll get a clear idea of the price and design ranges. The first kitchen is from an IKD customer in Massachussets. She had a very ambitious IKEA kitchen project: unifying two rooms to make a big kitchen. So it wasn’t just the cabinets; there were walls, windows and pillars to deal with. She said “Ready for a challenge? This is an awkward space. I’ve been considering going with IKD for awhile – I’ve read your whole website and I think you can make something happen!” Storage was very important. Lots of small appliances, that were used daily, needed to be stored. Also, Variera trash and recycling bins were to be placed inside the cabinets. IKEA’s Sektion cabinets were important because she has three children — so the cabinets needed to be strong — and of course, reasonably priced. We had to work quickly because she wanted to buy during both IKEAs and Semihandmade’s sale. For the wall cabinets she liked IKEA’s Voxtorp white doors — and base cabinet doors in Semihandmade’s Reclaimed Oak. Her space was an “L” measuring 78″ x 153″ and straight segment measuring 95″. The 101″ ceiling height gave us some flexibility to include 40″ high wall cabinets. It worked out that there was an ideal separate space for her refrigerator and two tall cabinets (yeah, more storage!). Even better it gave us a chance to introduce IKEA’s Jarsta orange doors for the tall cabinets as a way to frame in the stainless steel refrigerator. IKEA’s Voxtorp doors are so clean and modern. They contrast nicely with Semihandmade’s Reclaimed Oak. Ceasarstone’s pure white quartz countertop was lit up with IKEA’s Stromlinje and Omlopp lighting — accenting the design theme. 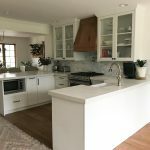 We were able to design her IKEA Voxtorp and Jarsta kitchen for $4,619. Semihandmade’s doors are in a separate quote. She did make it on time for the sale and got an additional 15% discount from both IKEA and Semihandmade! Kitchen number two is from a small home in Atlanta. Our customer was clear about two design points: he wanted an Apron Front sink and a Desk Area. And Grimslov doors. The kitchen included two “L’s”. The first measuring 112″ x 95″; the other 111″ x 84″. One side was for the fridge, wine storage and desk — the other sink, range and dishwasher. The ceiling height was 98″. Suprisingly he asked “Was wondering, could we use the open wall for pantry space, kitchen desk, and wine storage or do you think its unusable?”. He may have forgotten that he’s designing with Inspired Kitchen Design — we don’t do “Unusable”! He found a farmhouse sink he really liked (www.amazon.com/29-88-Single-Farmhouse-Kitchen-Finish) and we designed the base cabinet to fit it with one of our hacks: https://inspiredkitchendesign.com/ikea-kitchen-hack-cabinet-farmhouse-sinks-deep-cooktops/. He went with LG appliances and a Silestone quartz countertop. We don’t design that often with a six drawer base, but his girlfriend insisted they have them. The four glass doors each had an Omlopp spotlight that connected to the Utrusta worktop lighting sequence. He wanted a desk area that doubled as a counter for a quick meal. We left an open wall cabinet for day-to-day office supplies and covered the hinge holes with VARIERA cover plates. And, there’s no reason not to have a few bottles of wine near his desk; two Horda open white cabinets were designed within arm’s reach! The Sektion cabinets and Grimslov doors totaled up to $ 4,345. Not bad for a kitchen and working area. The folks in Kitchen number three wanted a farm house look in their Colorado home. To get there we designed with Bobdyn white doors and kept the existing wood floor. They added lots of wood furniture and other pieces to keep the room warm. The space was a “U” shape that included a peninsula. 90″ for the stove wall, 150″ for the sink wall and a 90″ peninsula. 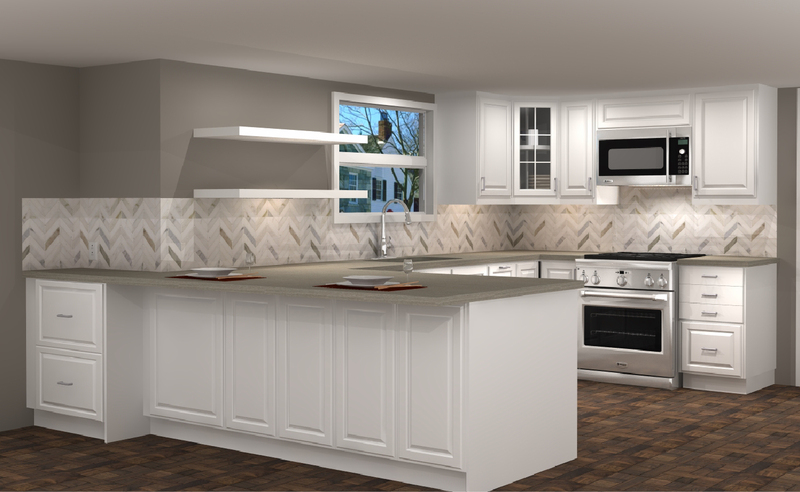 Our design followed the existing layout because the current wood flooring didn’t go beneath the old cabinets. (note to homeowners: this is why flooring must go from wall-to-wall) A major inspiration came from this blog: https://decoratop.co/2017/11/06/25-stunning-master-modern-farmhouse-style-decorating-ideas/. The Bobdyn doors kept the room bright and she did find a large wooden table for eight at a local market. Floating shelves aren’t available from IKEA; instead she bought them online: https://www.amazon.com/gp/product/B076KSCL19. IKEA’s Eneryda series cabinet pulls and handles looked fantastic with the Bobdyn doors. We found a perfect nook towards the backside corner of the peninsula and in it designed a drawer base for day-to-day countertop items. Fixed doors, instead of panels, along the back of the peninsula kept the farmhouse style. $4, 525 was the final price for IKEA’s Sektion cabinets and Bobdyn doors. It’s amazing how little IKEA kitchen cabinets cost. Our IKEA design team enjoys creating beautiful and functional IKEA designs — that are affordable. Maybe you can’t, or don’t have the time, to visit an IKEA. You’d prefer to get your IKEA kitchen design online. In just four days. And work with our professional kitchen designers. 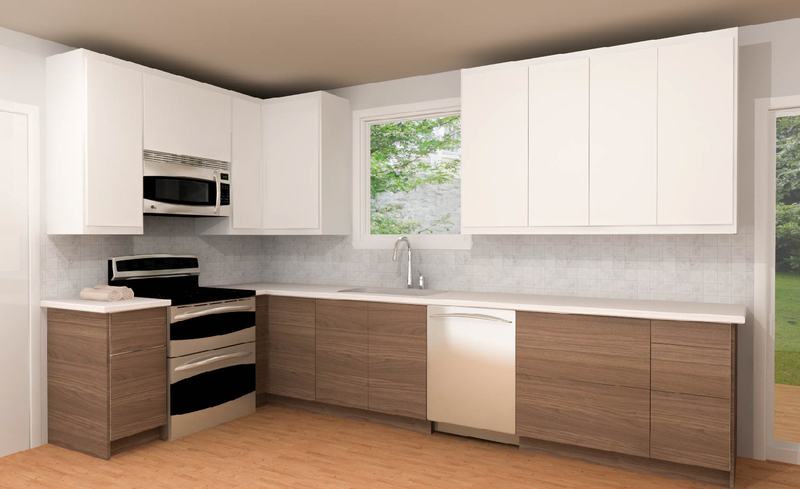 We provide a simple online path to design, purchase and install your IKEA kitchen. We’ll see you next time with more IKEA kitchen projects and costs.